How do you make the most of your first five years after college both personally and professionally? 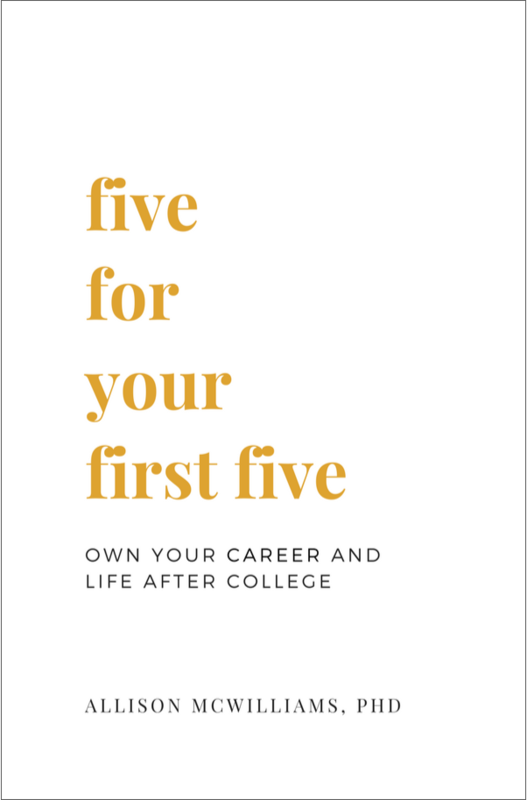 Five For Your First Five: Own Your Career and Life After College by Allison McWilliams, PhD, explores five key competency areas that you should be focusing on as a young professional. This book provides opportunities to reflect on your life, career path, and the choices that you are and will be making along the way. Get your copy on Amazon here! Want to engage in broader discussions about the topics within this book? Join our in-person Alumni Mentoring Groups, which will be using Five For Your First Five as the curriculum. Allison E. McWilliams is Assistant Vice President, Mentoring and Alumni Personal & Career Development, within the Office of Personal and Career Development at Wake Forest University. In these roles, she leads and provides training, support, guidance, and resources for formal and informal mentoring relationships for college students, faculty and staff, and alumni, as well as leading personal and career development programs for young professionals. She has written for and spoken to national and international audiences about effective mentoring strategies, leadership, and professional development. Prior to joining the University in June 2010, Allison was a public service faculty member at the University of Georgia, where she created, administered, and served as a facilitator for leadership development and organizational development programs and initiatives both for higher education and public sector audiences. Allison earned her bachelor’s degree from Wake Forest, and a master’s in public relations and a doctorate in higher education administration from the University of Georgia.